Cut Salmon into large dice and marinate with sherry vinegar, olive oil and seasoning for at least 30 minutes. Place all ingredients in a non-reactive bowl and let sit for 1 hour then place mixture in a blender and blitz on high for 4 minutes. Finally pass through a fine strainer and pour into a plastic beaker with a lid. Shave fennel on a mandolin over a bowl, zest the lemon over this using a micro-plane zester and add the juice of a ¼ of the lemon, the pickled lemon and the chopped fennel. Then add the lemon oil and seasoning and reserve. 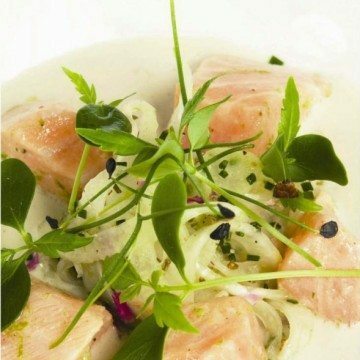 Place 200ml of Ajo blanco into each soup plate and place a mound of the fennel salad onto the centre of each plate, surround with 5 pieces of salmon ceviche, a drizzle of chive oil and a small selection of the micro leaves.